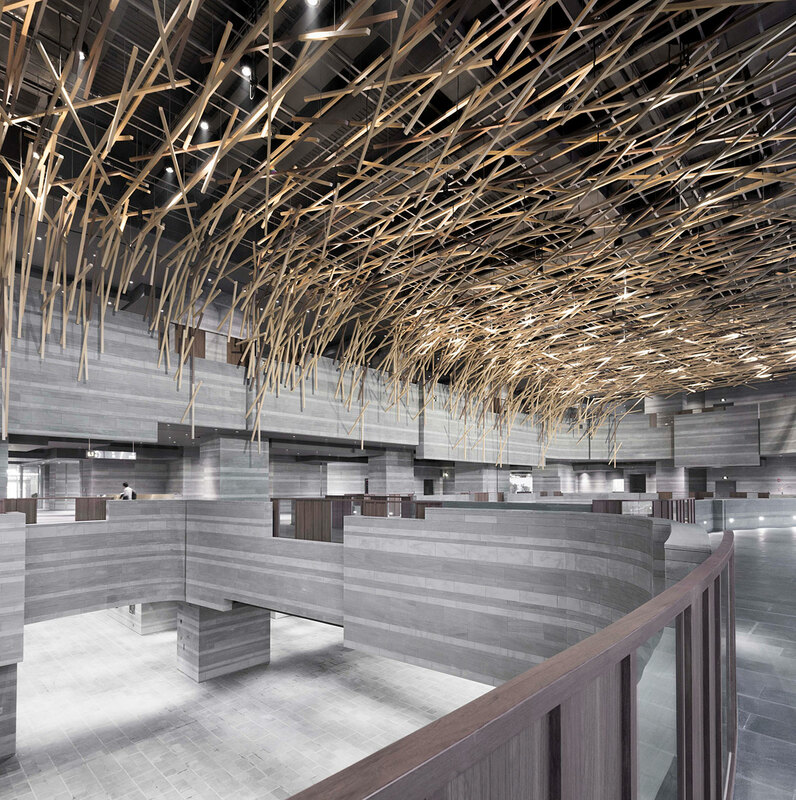 Part of a new mixed-use development in Hongqiao District in Shanghai, the HUB Performance and Exhibition Center was designed by local practice Neri&Hu Design and Research Office as an oasis of culture at the heart of a brand new commercial development. 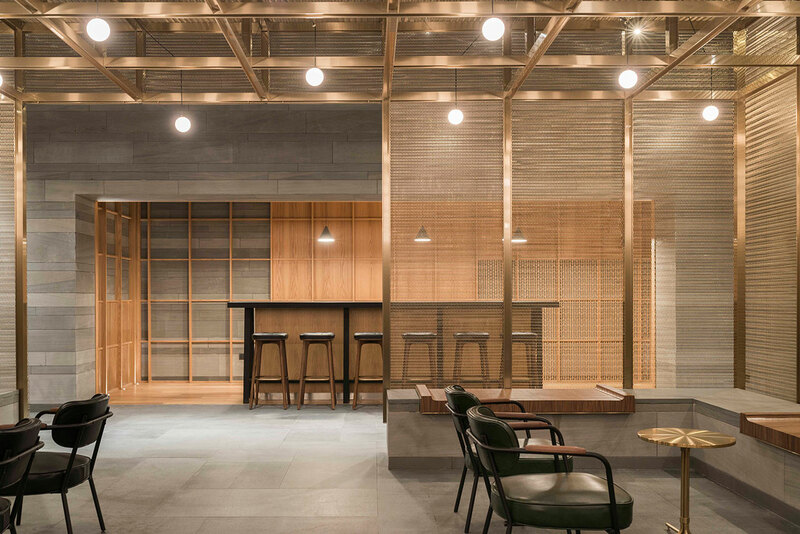 By using a language of natural forms and textures that invokes nature-like landscapes, the designers have created a series of interior spaces that unfold with organic intensity and sculptural precision. As its name suggests, the HUB development, which includes office buildings, a hotel and a shopping mall, is located right in the center of a transportation hub that connects the city's second international airport, its high-speed and conventional inter-city rail services as well as metro system and other public ground transportation. With an exterior designed by architect Ben Wood, the new Performance and Exhibition Centre is surrounded by office blocks of rectilinear geometry, and was designed, both figuratively and symbolically, as a vital organ pumping culture into the district. The juxtaposition between the Center’s exterior form with that of the adjacent buildings is picked up by architects Lyndon Neri and Rossana Hu, lead designers of the interior fit-out, who have developed an aesthetic inspired by nature and local traditions that is meant to provide, in their own words, a “retreat from the heavily built context and visual overload of contemporary culture”. At the center of the building, a three-storey atrium connects the exhibition spaces located at the basement level and on the ground- and first-floor galleries. Featuring an intricate sequence of balconies, canopies, setbacks and openings, these spaces are clad in grey sandstone of different shades creating horizontal stripes that evoke the striated surfaces of carved rock. Looking up, a plexus of walnut- and oak-covered aluminium sticks float like the roots of a forest seen from the underground, a sensation amplified by the cavern-like atrium as well as the tunnel-like escalators connecting the three floors that seem to have been carved out of a solid rock formation. 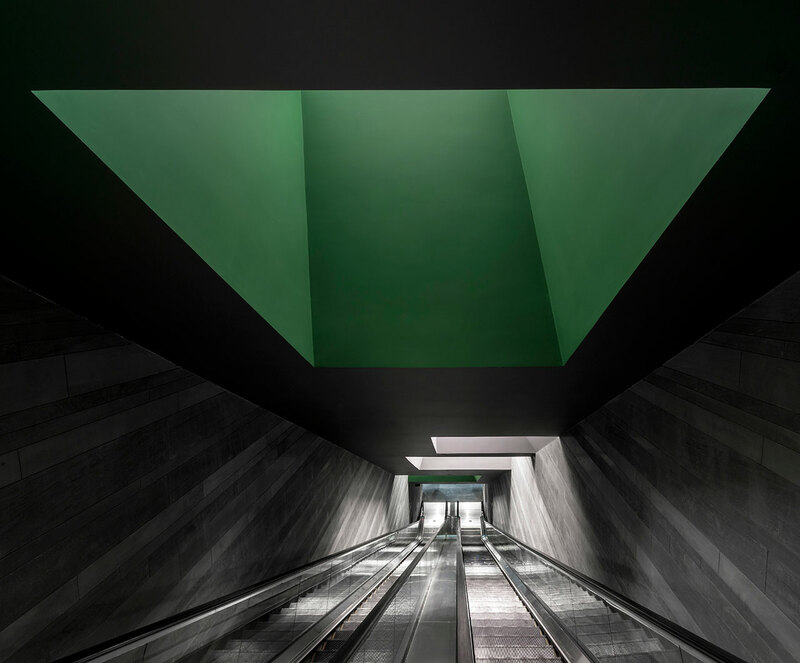 This results in visitors accessing the Center from the subway station via the basement level literally emerging from the underground. 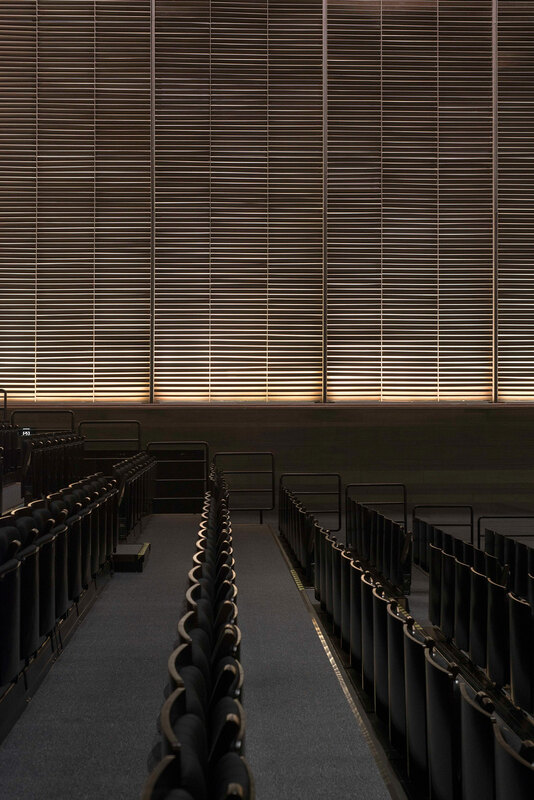 Rectangular in shape and three-storey in height, a 750-seat performance auditorium was built above the exhibition spaces, designed as a "treasure box" hidden inside the sandstone building mass. 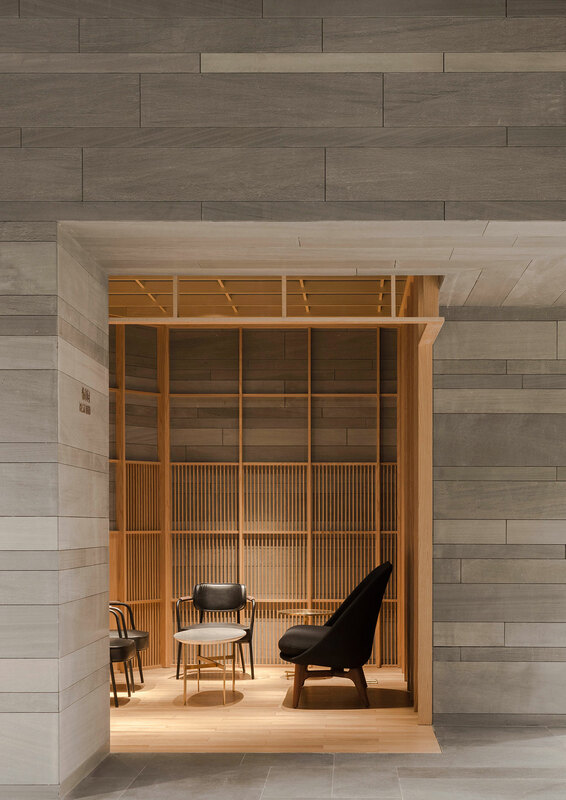 As in the spaces below, wood -in the form of slat screens covering the walls- is used to provide a respite from the harder stone surfaces but also alludes to the ancient Chinese practice of writing texts on scrolls made out of slats of bamboo. 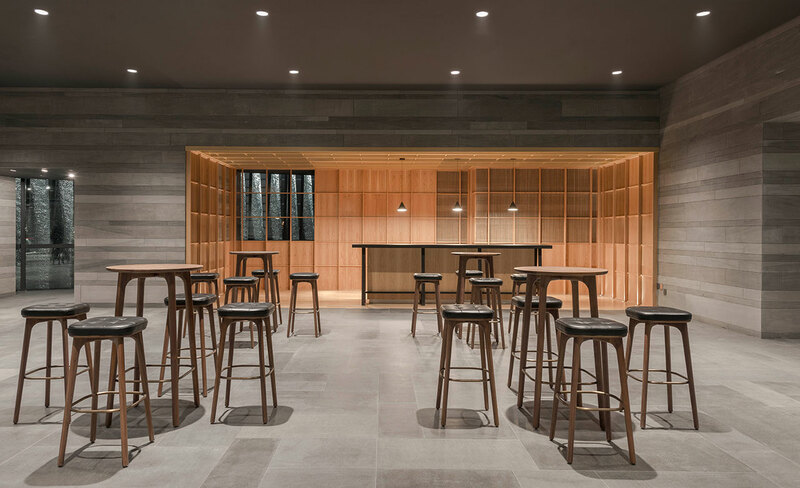 Exposed ceiling fittings painted all black and tiered seating complete the theatre's minimal aesthetic. 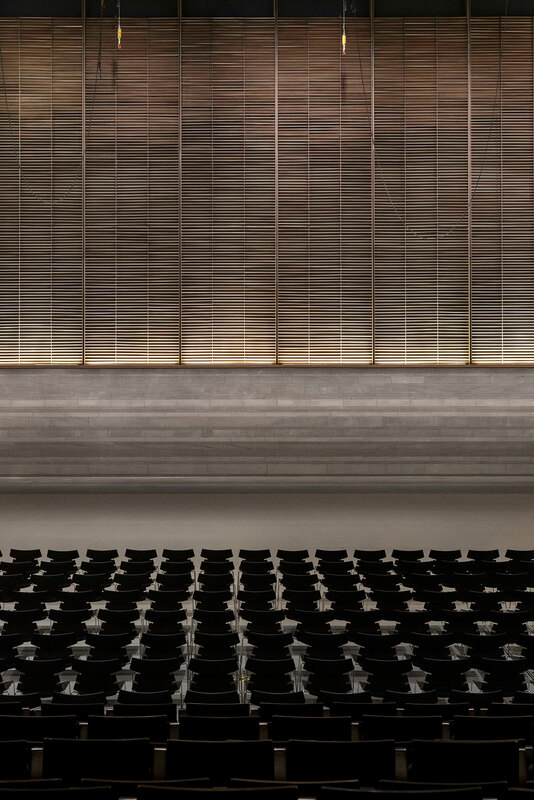 Slat screens cover the walls of the auditorium, alluding to the ancient Chinese practice of writing texts on scrolls made out of slats of bamboo. 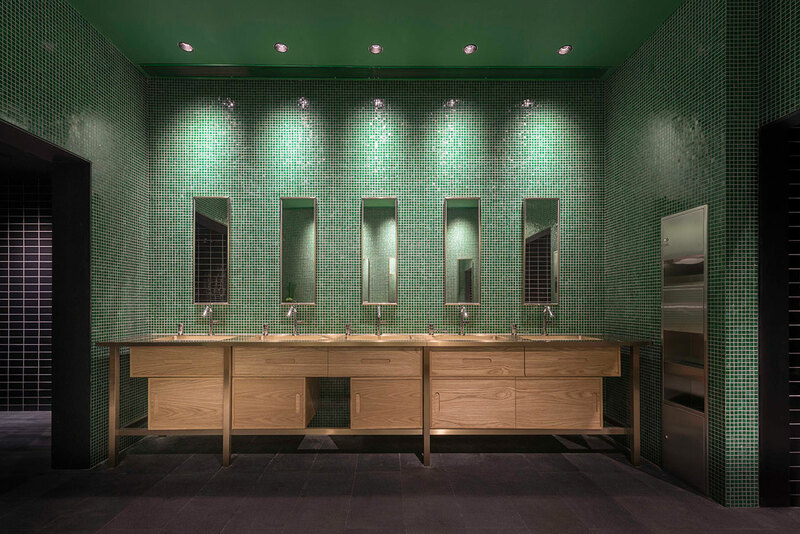 Peripheral spaces, “carved out” of the sandstone volume, include bars (which are designed as wooden houses), a cigar room and bathrooms that feature black-glazed tiles, green wall mosaics, wooden wash-basin counters and golden toilet cubicles. 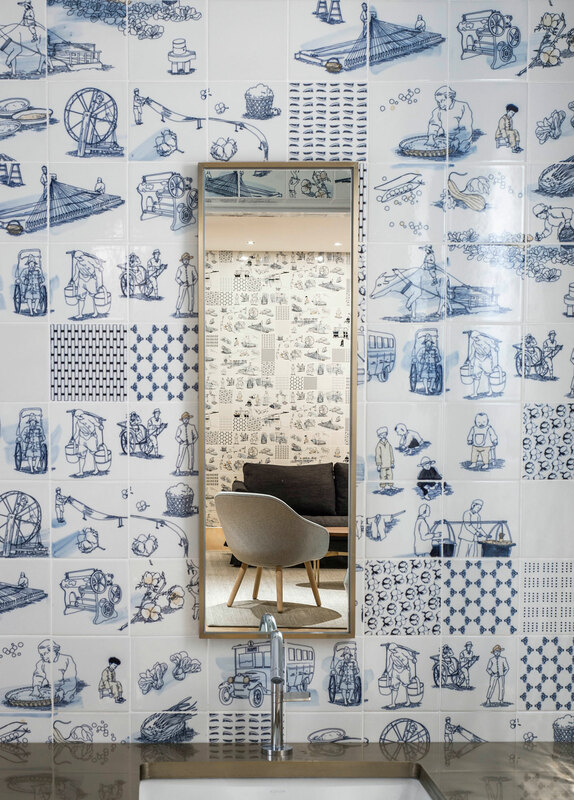 Traditional forms are further explored in the VIP lounge showcasing a golden trellis dotted with intricately crafted pendant lights, as well as in the private viewing rooms that are clad in hand-painted tiles that narrate the story of Hongqiao District’s humble past. 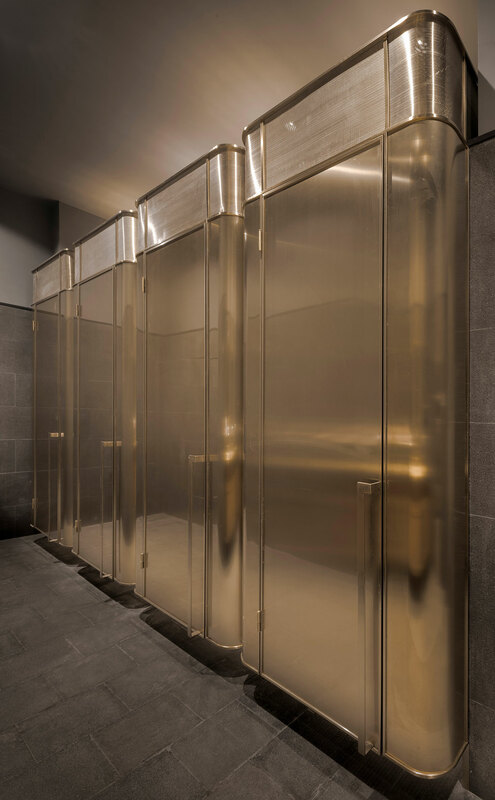 Bronze-hued lifts connecting all five floors complete the visceral interiors that seek to transport visitors to a nature-like environment where treasures can be found and the arts can blossom. 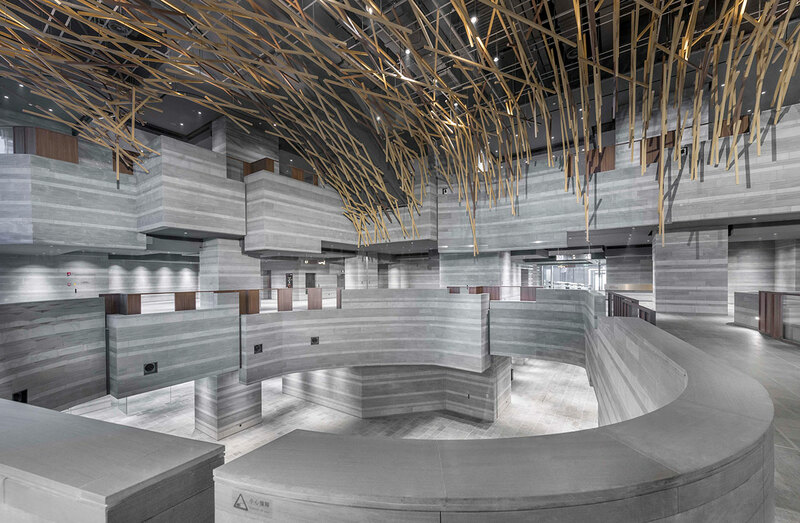 By using a language of natural forms and textures that invokes nature-like landscapes, the designers have created a series of interior spaces that unfold with organic intensity and sculptural precision. 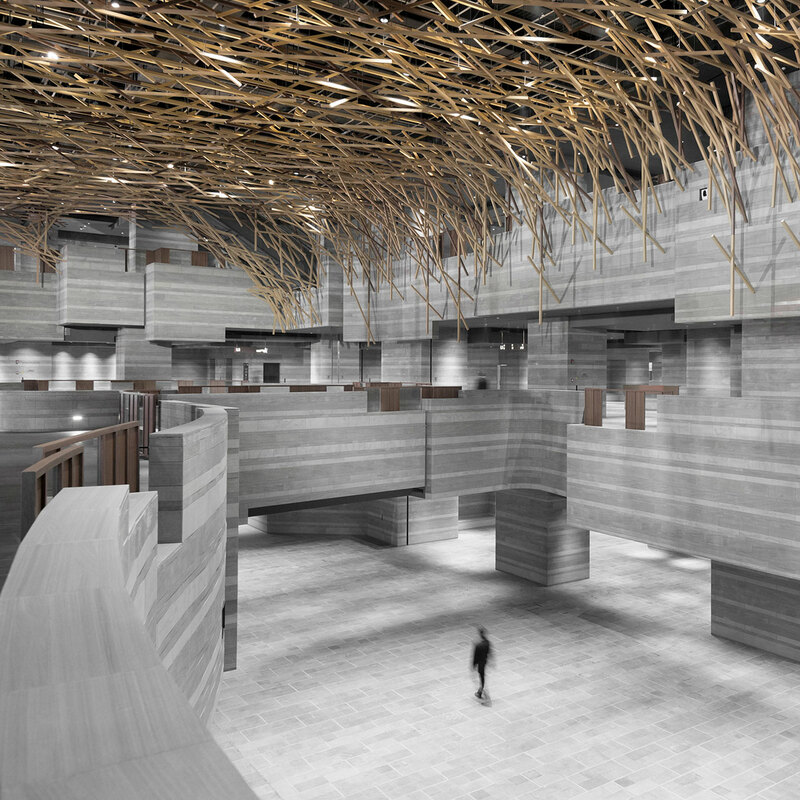 The HUB Performance and Exhibition Center in Shanghai by Neri&Hu. Video direction by Pedro Pegenaute.